Our guest today is Katy Beebe, author of Brother Hugo and the Bear, a clever tale — based on twelfth-century manuscript marginalia — about a hungry bear’s taste in, or rather for, books. 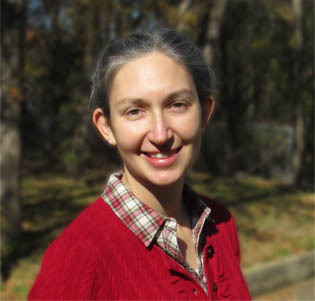 Beebe is also an Oxford-educated professor of medieval history and digital humanities at the University of Texas at Arlington, and she was kind enough to answer several questions about how this “day job” intersects with her work as a children’s author. How does your “day job” as a history professor intersect with and contribute to your writing? I had thought about being a writer before I ever thought about being a college history professor — but I have found that part of the fun of both professions is that there is always a lot of writing to do. Both types of writing have a different style (not too many footnotes in picture books, for example), but each time you sit down to face that blank page, the excitement and the nervousness are the same. My notes from graduate school all have little marks in the margins — alongside the more scholarly commentary — for story ideas. A medieval pilgrimage account, for example, or a fifteenth-century manuscript, or something that I heard in a seminar might prompt a seed for a new project. 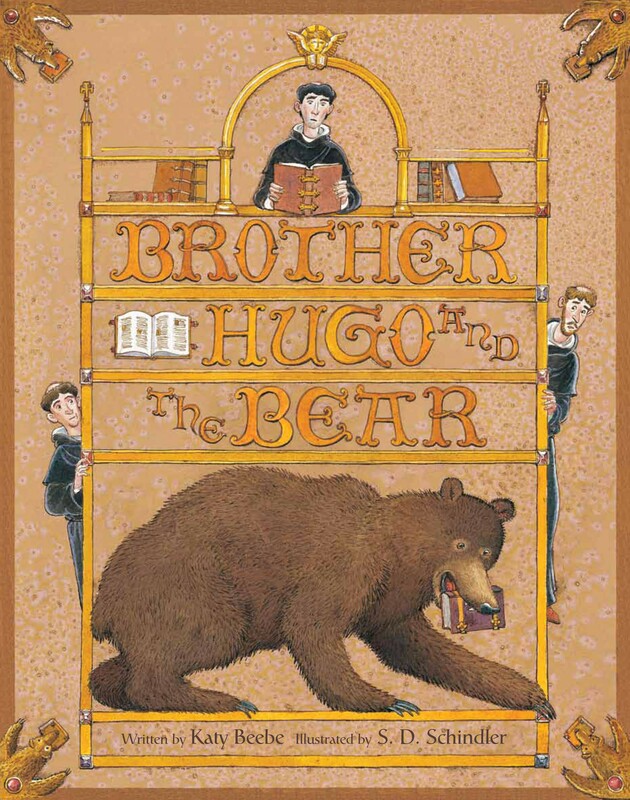 Brother Hugo and the Bear came from just that intersection of my “professional” life as a medieval historian and my love of writing children’s books. I first became aware of the letter of Peter the Venerable, where he mentions a manuscript-munching bear, because of something my friend and doctoral supervisor happened to say in Oxford University’s Medieval Church and Culture seminar. What I love about teaching history — trying to make a culture that usually seems so distant to us a bit more understandable by telling a good story — is not so different, I feel, from trying to get a reader interested in a story that I make up myself. Do your college students know you write children’s books? Have any of them read and/or commented on Brother Hugo and the Bear? How did you choose Brother Hugo’s name (and the names of his fellow monks)? Brother Hugo’s name was inspired by one of my favorite medieval scribes, “Hugo pictor ” — a monk who left an endearing portrait of himself at the end of a twelfth-century commentary on Isaiah. I’ve blogged about Hugo pictor here. I had a lot of fun with the names of his fellow monks — they’re certainly a diverse monastic community! I don’t appreciate children’s books that wink over the heads of their youngest readers, and I hope that instead of being simply a “medievalist in-joke,” the connections between the monks’ names and the tasks that they help Brother Hugo with will entertain readers as they learn more about the Middle Ages. For example, Brother Caedmon helps Hugo with a sheep’s skin for parchment, and the historical Caedmon was a shepherd before he became a monk at St. Hilda’s abbey in Whitby. Brother Martin, who offers Hugo a goose feather to make into a quill pen, in addition to honoring a great friend at the Bodleian Library in Oxford, also recalls the medieval St. Martin. According to legend, St. Martin tried to conceal himself from a crowd who wanted to make him bishop, and noisy geese revealed his hiding spot. I’ll leave it to readers to form their own conclusions as to why Brother Bartholomew is the one who lends Hugo a knife to prepare the sheepskin for parchment! What are your thoughts on S.D. Schindler’s illustrations for the book? I can hardly express how thrilled I was when I first saw Steve’s illustrations for Brother Hugo. I’m still thrilled with them, each time I open the book. I had lived with my own image of Hugo in my mind for years — in my head, he was rather portly and older — but Steve’s Hugo is young and a bit naïve. Yet, the moment I saw him, I thought, “Of course! That’s Brother Hugo!” Steve took the story and enriched it in ways I had never thought possible: The hidden bear in many of the pages! The formula for creating ink! The spectacular endpapers, worthy of a medieval Book of Hours! I loved all the questions that Steve had during the process: what did the Grand Chartreuse look like? What did Brother Hugo and his brethren wear? What would have covered a twelfth-century manuscript? He would ask our editor, Kathleen Merz, and she’d e-mail the questions on to me. I’d give my best guess and return an answer through Kathleen. In a way, we were corresponding in a similar manner to Peter the Venerable and Prior Guigo of the Grand Chartreuse — but whereas they were trading ideas in parchment and ink, we were exchanging thoughts through electricity and light. My desk has a pile of books on it at the moment, all reflecting different parts of my life. For class, we’re reading Joan of Arc’s 1429 letter to the English forces, against whom she was fighting during the Hundred Years’ War. She calls out the King of England himself, and in the strongest possible terms. To the Duke of Bedford, she says, “Duke of Bedford, who call yourself regent of France for the King of England, the Maid asks you not to make her destroy you.” It’s strong rhetoric, especially from a seventeen-year-old medieval peasant girl. For research, I’m reading Kathryn Rudy’s Virtual Pilgrimages in the Convent, about nuns who imagined themselves on pilgrimage to Jerusalem, for my next scholarly book; and Growing Up and Getting Old in Ancient Egypt by Rosalind and Jac Janssen, for my next book with Eerdmans Books for Young Readers: Nile Crossing. I have also just finished the most exciting urban fantasy YA novel, Shadowshaper, by Daniel José Older, edited by my friend Cheryl Klein. The heroine, Sierra, paints her way through Brooklyn summer days and nights that thrum with the supernatural and the spiritual — and learns about her own powers to love and to fight and to save. Sassy, gritty, real, and magical, it’s pitch-perfect and honest, and one of the best books I’ve read all year. In addition to these, my seven-month-old son and I have been enjoying board books together. His favorite at the moment seems to be Eric Carle’s Brown Bear, Brown Bear, What Do You See?, judging from the way he kicks and coos each time I turn a page. Other favorites of ours include Janet and Allen Ahlberg’s Each Peach Pear Plum, and Bruce Degen’s Jamberry. I read them aloud; he listens and then chews on them. What a pity that the tenure committee won’t apply due scholarly weight to BROTHER BEAR along with your other publications! How wonderful that your son’s favorite board books also have delightful bears. They do count BROTHER HUGO toward “community service and engagement,” so I have no complaints. You’re absolutely right about the bears in our books. What fun — I hadn’t realized that!